Ghent may not be the first city that comes to mind when you think about traveling to Europe, and that may be one of the top reasons to go. 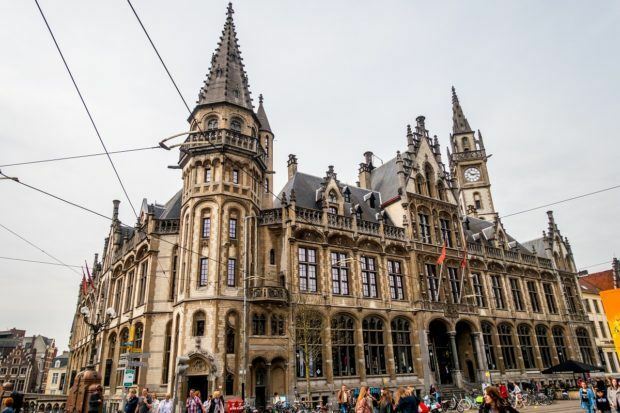 Without the mass of tourists that can overwhelm some gorgeous cities, Ghent, Belgium, is a place where you can see the sights, wander the streets, and hang out with the locals without competing for space or being turned off by tourist touts. Traveling to Ghent almost feels like discovering a secret. Its stunning Gothic buildings are mixed in with street art, waterfront cafes, and even a castle. There are enough fun things to do in Ghent to occupy a whole weekend, if not longer. This beautiful city is one of our favorite recent discoveries, and we can’t stop singing its praises. 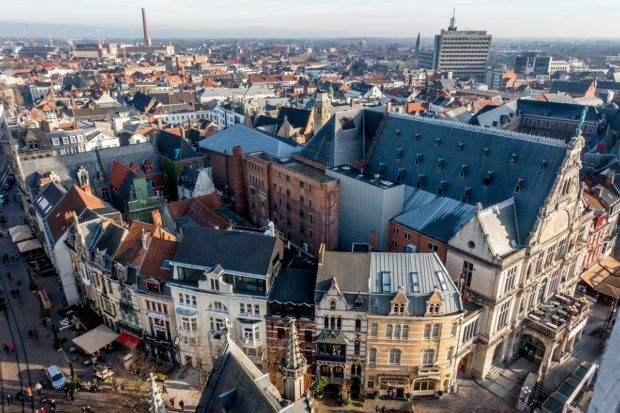 For the best view in Ghent, head up the belfry (belfort). It’s not often in Europe that you find a 14th-century bell tower where you can take an elevator instead of trudging up 300+ stairs. When that happens, take advantage of it. 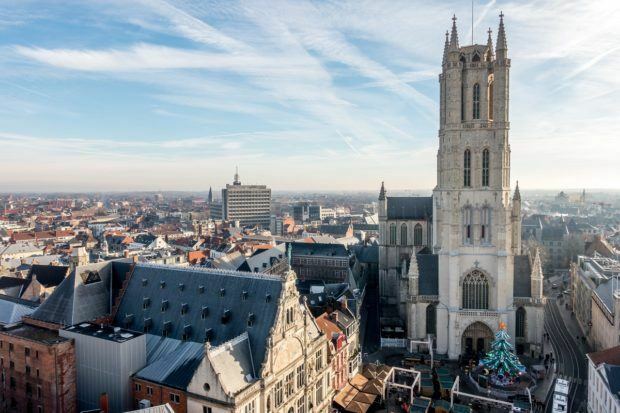 The 300-foot-high Belfry of Ghent is a UNESCO World Heritage Site and one of the top things to see when you visit Ghent. Finished in 1380, it was the primary watchtower for the medieval city, and its carillon announced the time and gave warnings. 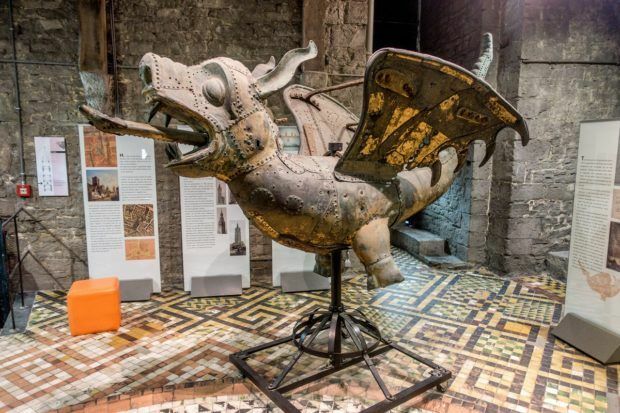 On the way up, there’s an exhibit about the belfry’s famous dragon weathervane, which has guarded the site since the tower was built. There are two previous incarnations of him in various states of completeness. You’ll also see a the giant bell called “Roland” and a huge rotating drum that looks like the inner workings of a music box, which is responsible for the music of the carillon. But the real attraction is the view. It’s one of my favorite places in Ghent. The belfry is the middle of Ghent’s three towers, so it provides a great view of St. Nicholas Church and the old center of Ghent on one side and St. Bavo on the other. If you’re interested in getting a nice photo of St. Nicholas as in our photo above, arrive mid-morning when the sun will be behind you (and hopefully not casting too many shadows). One of the top Ghent attractions is right in the city center. The 12th-century Castle of the Counts (Gravensteen) is impossible to miss. With a moat and turrets, the imposing structure looms over the Lys River. 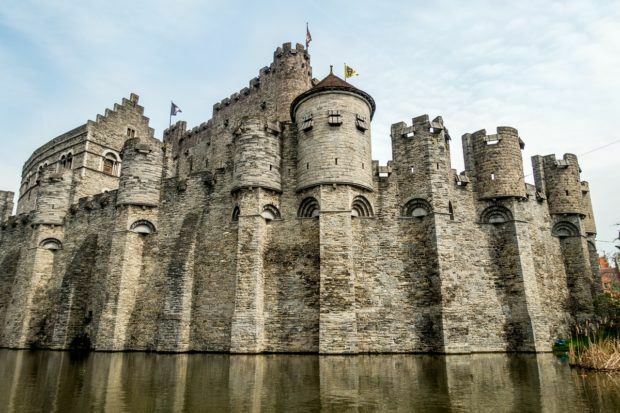 From 1180 until 1353, the castle was the residence of the Counts of Flanders and heavily intertwined in the political happenings of Ghent. It was built by Count Philip of Alsace on the site of an earlier fortification. With its battlements and arms, it was meant to show his strength in the face of frequent challenges from Ghent’s upper class. After the Counts left, the castle in Ghent was used as a court and a prison and ultimately became a cotton mill, gradually falling into disrepair. After an extensive restoration, the Castle of the Counts sports a unique collection of torture equipment and the odd suit of armor, though furnishings are generally sparse. A 45-minute audio guide provides a little bit more context to the rooms and the castle’s story but is much more entertainment than historical information (it’s voiced by a Belgian comedian). The gatehouse, ramparts, keep, and stables are open to visitors. Like the belfry, the Castle of the Counts provides spectacular views from the top. First a church and then a library, the 16th-century Baudelo Chapel is now one of the coolest places to eat in Ghent. When we read that it was inspired by some of our favorite food halls in Rotterdam and the markets of Copenhagen, we knew we would love it before we even set foot inside. 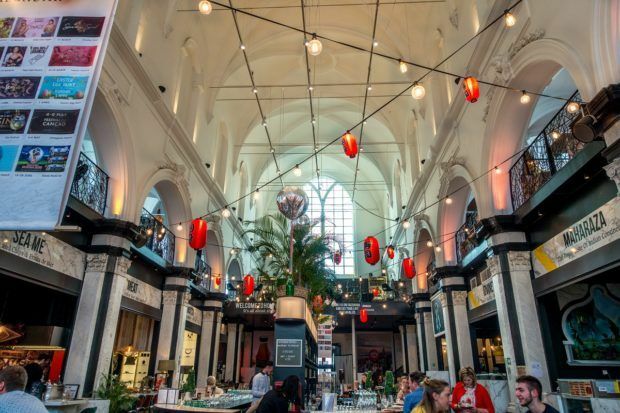 The vaulted ceilings and bright windows where the stained glass used to be leave no doubt about the original purpose of the Holy Food Market space. But now there’s a bar right in the center. And somehow it all works perfectly in this temple of gastronomy. There is a wide variety for food to choose from. About a dozen stalls offer cuisine from all over the world. You can opt for sushi from Komatsu, Italian specialties from L’Arrosticino, or Portuguese tapas from Taberna Lisboa. There is also seafood, Indian, and several vegan options, too. If ice cream is your passion, stop by the Magnum Pleasure Store to customize your own creation. 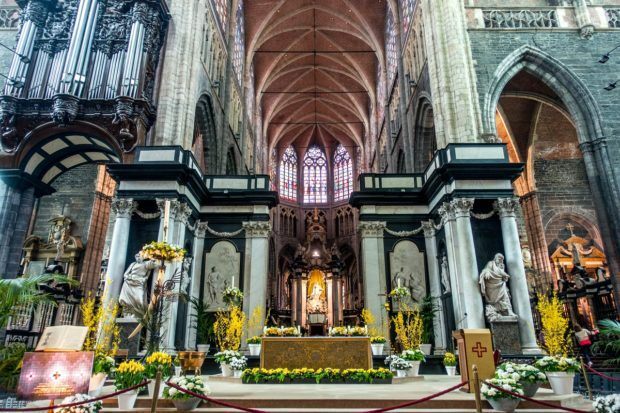 There has been a religious building on the site of St. Bavo’s Cathedral for over 1000 years. 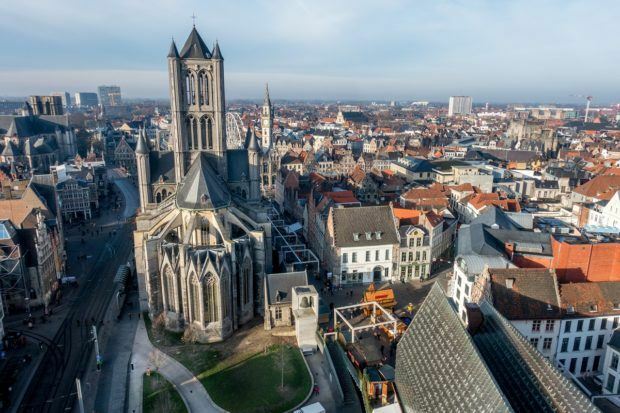 The current Gothic cathedral—complete with its 290-foot-high bell tower—is one of the most popular Ghent tourist attractions. The cathedral itself is magnificent. 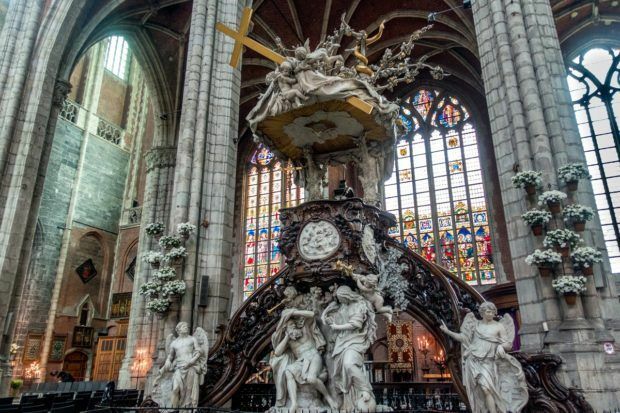 With four grand organs, a Baroque high altar, a painting by Peter Paul Rubens, and a pulpit made with marble and gilded wood, the cathedral offers lots to see. But the real reason people flock to St. Bavo’s is the Ghent Altarpiece (which you’re not allowed to photograph). Officially titled The Adoration of the Mystic Lamb, the Ghent Altarpiece is considered the first Renaissance masterpiece and one of the best artworks in Belgium. The 20-paneled work was completed in 1432 by the Van Eyck brothers and is one of the earliest-known oil paintings. The painting has been stolen, traded, and nearly destroyed by the likes of Austrian Emperor Joseph II, Napoleon, and Hitler. Given its age and its troubled history, it’s a miracle that the painting survives at all. Recent restoration work has cleaned the painting and removed earlier “fixes.” The colors now are spectacular—it looks like it was painted last week rather than 600 years ago. Seeing the altarpiece requires a ticket, which comes with a detailed audio guide (St. Bavo’s is otherwise free to enter). Every day from 12:00-1:00pm, the panels are folded inward, displaying the work on the outside. 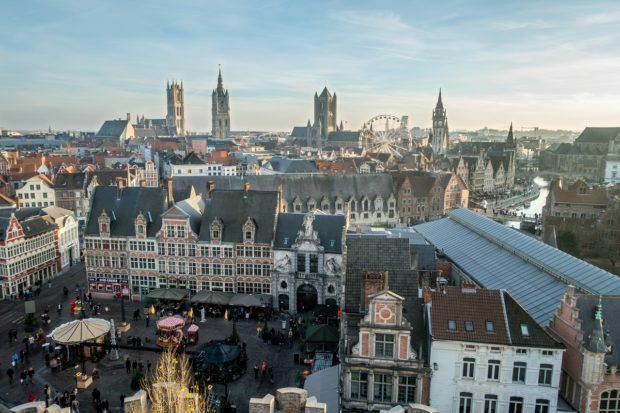 Lines can be long for this popular site, so if it’s on your list of places to visit in Ghent, going early or late in the day is usually better for avoiding crowds. 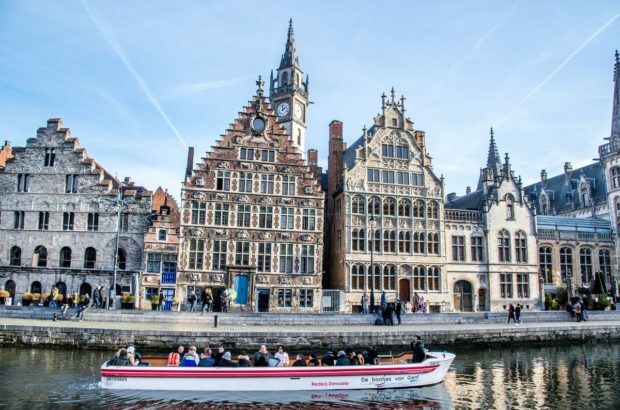 Don’t miss out on seeing Ghent from the water. There are several options, but the one we took leaves from just in front of the Ghent Marriott. In several different languages, the captain provides a guided tour and a deeper look at the history of Ghent and its beautiful buildings. A canal cruise is the perfect opportunity to rest your feet and learn a little bit at the same time. Street art is one of our favorite things to discover in a city, and Ghent city center has a vibrant street art culture. Throughout the city, there are large murals by well-known artists as well as smaller works by up-and-comers. There is no shortage of legal canvasses for artists to show their stuff, and Ghent celebrates their contributions to the city’s art scene. 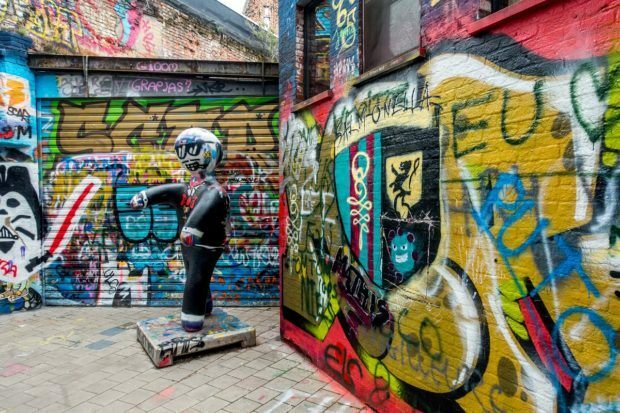 One stop on the must do list for many visitors is Werregarenstraat, now known to most as “graffiti alley.” The pedestrian street in the center of Ghent is a mixture of work. 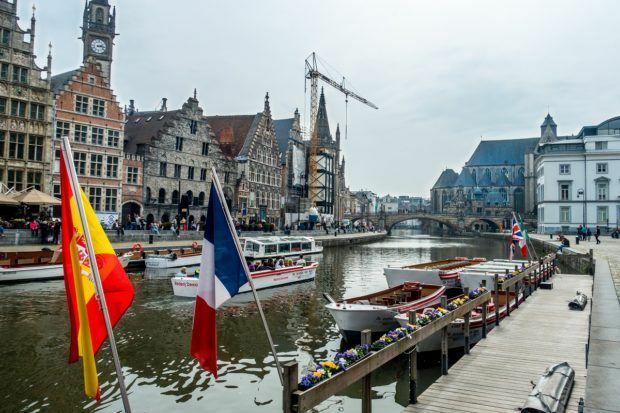 Started during the Ghent Festivities in 1995, the project is never the same from one week to the next with new tags and designs appearing all the time. Elsewhere in the city are alleys filled with cartoon characters, bright blue bandits on the sides of buildings, and all kinds of otherworldly creatures. Acclaimed artist and Ghent native Roa has contributed works featuring his large-scale animals. 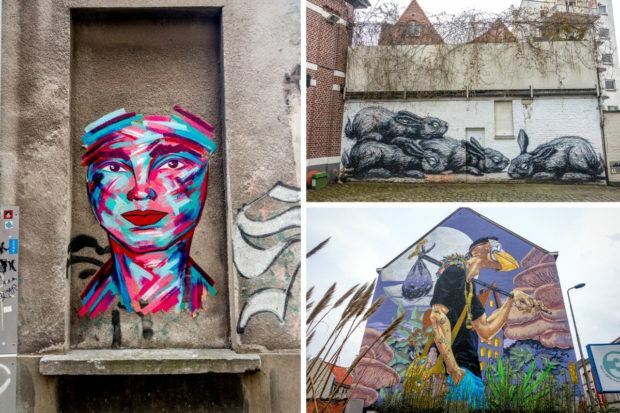 To discover Ghent’s street art on your own, follow the downloadable guide from ‘Sorry, not sorry’ or pick up a map at the tourism office that marks many of the sites. 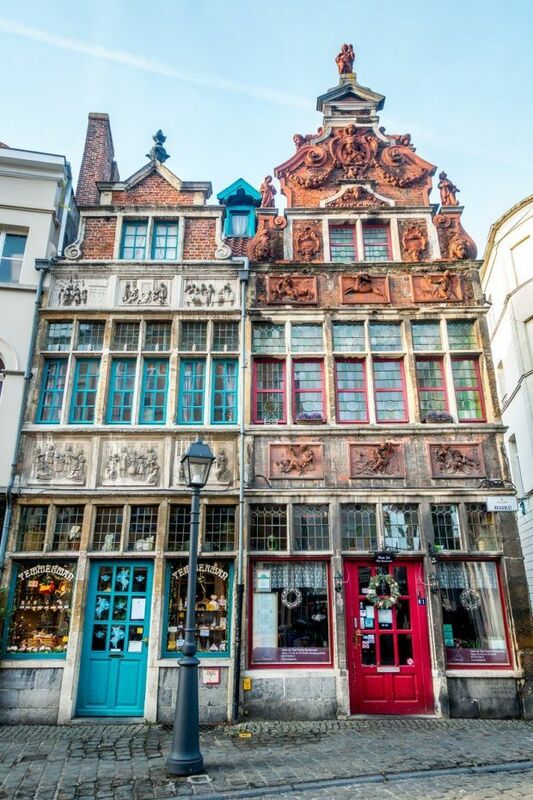 Originally a covered market, the Butchers’ Hall on Groentenmarkt Square dates back to the 15th century. Its impressive wooden vault was built entirely without nails, and those rafters now support traditional drying Ganda Ham, a local specialty. 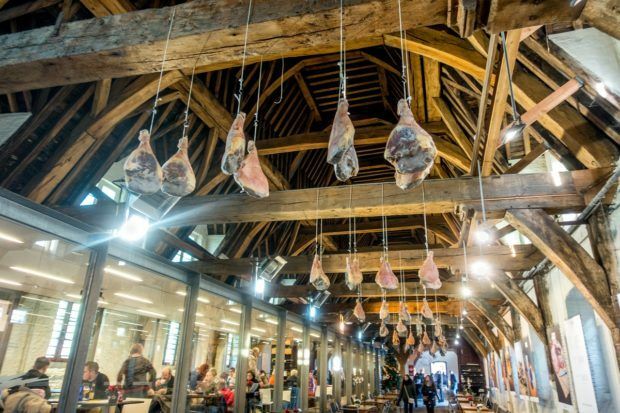 With a nod to its roots, the Butchers’ Hall is the best place for finding authentic East Flemish food in Ghent. This is no small feat considering that there are more than 175 traditional regional culinary products, and the Butchers’ Hall has them all. In addition to the ham, you’ll find delicious Tierenteyn mustard, Breydel bacon, numerous local beers, cheeses and cheese croquettes, and so many other tasty things. The products at the Butchers’ Hall can be bought individually or put together in a gift pack, and many are suitably wrapped to get through customs if you want to take them home. To try the food in the moment, check out the on-site restaurant. 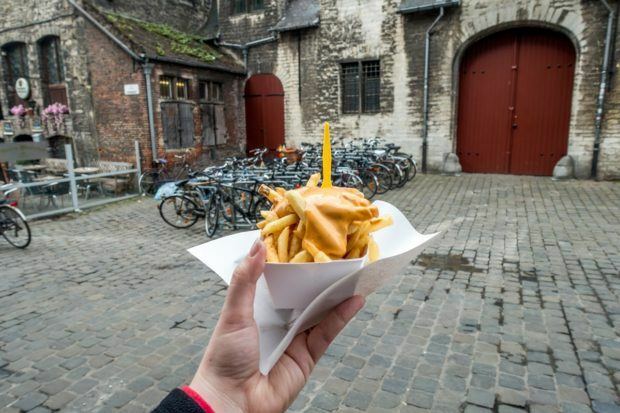 The best frites stand we found in Ghent is just outside the Butchers’ Hall. In fact, right up against it in a red alcove. You would almost walk right past it if not for the line of people. The no-frills counter serves great fries with a variety of sauces. Try them with traditional mayonnaise, our favorite curry sauce, or whatever floats your boat. Escargots and croquettes are popular here, too, for just a few euro. Saint Nicholas Church is one of the most prominent Ghent landmarks. Built beginning in the 13th century, it was constructed primarily in the Scheldt Gothic style using bluestone from the Tournai area. 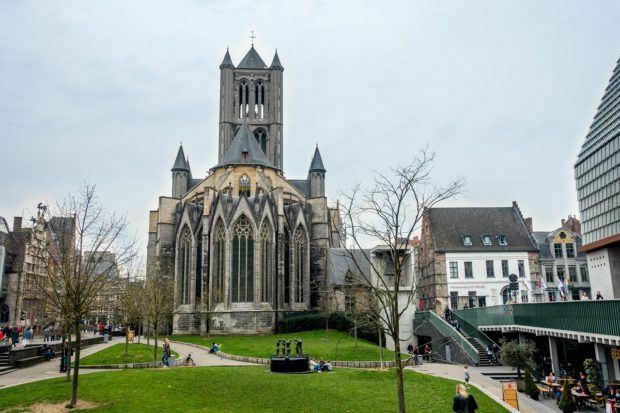 With turrets on either side and a central tower, Saint Nicholas is easily one of the prettiest places to see in Ghent. With its position near the Belfry and Saint Bavo’s, it becomes the third of the three towers that the city is known for. If you begin to cross St. Michael’s Bridge next to the Korenmarkt and then turn around, you’ll be provided with a fabulous view of these historic buildings. The inside of the church is fairly typical of historic Belgian churches, but it can’t hold a candle to St. Bavo’s (few places can). It’s worth a quick visit to the interior because visiting the church is free, but we found the outside to be the highlight. One of the oldest and largest squares in the city of Ghent, Vrijdagmarkt square gets its name from the weekly market held here. Each Friday and Saturday, the square fills with vendors selling local delicacies, clothes, and household items. 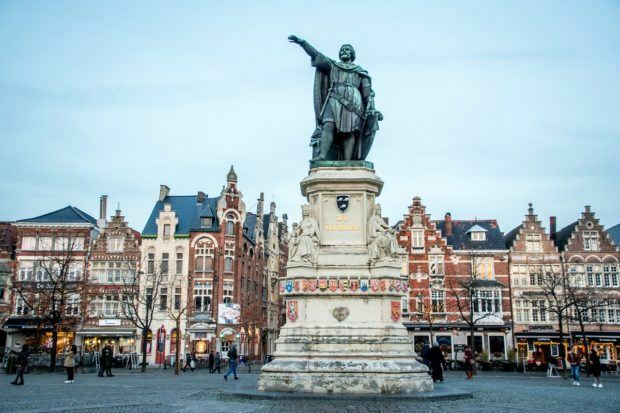 A statue of the prominent 14th-century businessman Jakob van Artevelde overlooks it all. Around the square is the Ons Huis (“House of the People”), the headquarters for the region’s socialist movement, and lots of places to eat and drink, some with outdoor patios. If you missed the frites stand by the Butchers’ Hall, there’s another great option here—Frituur Jozef fry wagon. Directly behind the Van Artevelde statue is Baudelostraat, home to lots of vintage shops. We liked it most for its string of colorful buildings with ornate gables and balconies. 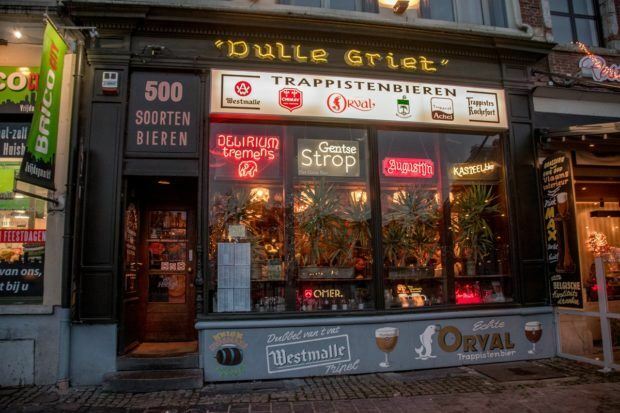 Dulle Griet is one of the top bars in Ghent for beer lovers. With over 500 beers on the menu, it’s hard to imagine anything this pub doesn’t have. Named after Ghent’s massive cannon now just around the corner, beer café Dulle Griet has a cozy medieval interior with wagon wheels, beer barrels, and lots of throwback beer advertisements. There are many great beers to try here, but the Max is the reason this place is well-known. Max beer comes in a giant, specially-made glass, complete with a wooden stand to keep it upright. Visitors have loved the glass so much, they’ve tried to take them home (although they’re so large, that seems difficult). Dulle Griet has come up with an easy solution: get a beer, give your shoe. When a customer gets their Max beer, the server rings and bell and a basket is lowered from the ceiling. The shoe goes in, and the basket gets hoisted right back up. You get your shoe back when you’re finished. It’s possibly the most unique kind of insurance we’ve seen, but it’s all in good fun. 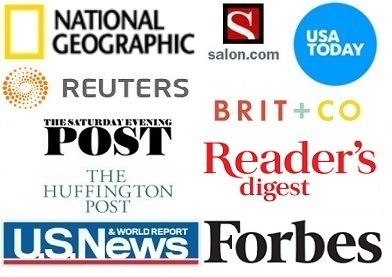 If you’ve never heard of a cuberdon, you’re not alone. This deep purple sugar cone is Ghent’s signature candy. Don’t leave the city without trying one. There are two different theories about the candy’s origins. One is that it was created in Bruges by a member of the clergy—hence, the “cleric’s cap.” The other its that it was developed by accident when a pharmacist found cough syrup that hardened on the outside but was still liquid in the middle. Luckily, there’s nothing medicinal about this treat. The easiest place to be guaranteed of getting a cuberdon is at the Groentenmarkt adjacent to the Butchers’ Hall. There, you’ll find two carts—historic rivals for your business—piled high with colorful cone-shaped candies. Cuberdons have a thick sugary shell with a filling of the same flavor. The purple ones, which are most traditional, are raspberry flavored. There’s also apple, strawberry, lemon, and blueberry. At the time of our visit, we got a mixed big for €5 euro, which is the easiest way to try all the varieties. The Korenmarket is as close as Ghent comes to having a main square, more because of its location near several main sights than because of its size. On the corner is the former post office, which is now shops and a hotel called 1898 The Post. There’s also the beautiful St. Nicholas Church with its bluestone. The square is surrounded with several historic buildings, which are now bars and restaurants that have patio seating. In nice weather, the Korenmarkt is like one giant outdoor café. Pause a minute to have a coffee and do a bit of shopping. The Korenmarkt is also the ideal place for a little people watching. The quays of the Lys River are lovely places to spend some time. Korenlei (Wheat Market) on the left bank and Graslei (Grass Market) just across the water on the right bank have historic buildings and a high concentration of outdoor cafes. The sites date back to the 5th century when Ghent was the center of the wheat trade in the County of Flanders. Most of the current buildings were built in the Middle Ages, although they have been restored and modified over the centuries. We’re suckers for this kind of architecture, so walking along the banks is pretty dreamy. Some of the buildings have been turned into restaurants and cafes. In decent weather, their outdoor patios fill with people enjoying the sun by the waterside with a Belgian beer (or two) in hand. The quays are a great place to sit and enjoy life. Traditional Belgian cuisine is not exactly known for being light. Made up of stews, meatballs, frites, and fried croquettes, a lot of meat and potatoes is involved. Ghent is expanding the options. 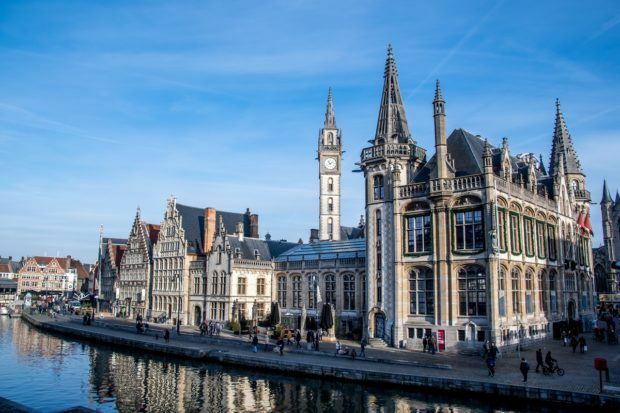 Ghent calls itself the “Veggie Capital of Europe.” There are more vegetarian restaurants per capita than in all other cities in Europe, and Ghent serves more vegetarian meals than anywhere in Belgium, thanks, in part, to its large student population. Thursdays are “veggie days” in the town of Ghent. 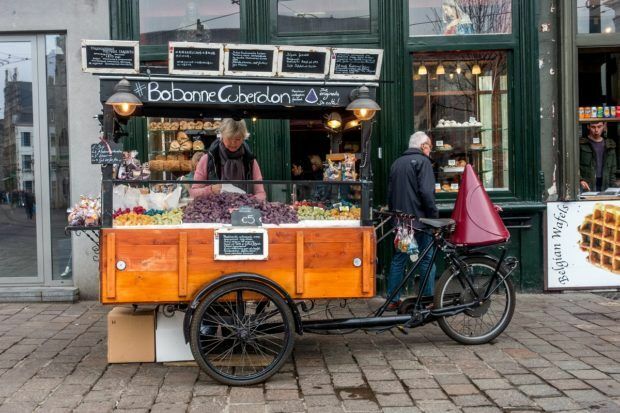 Dozens of restaurants and hotels offer vegetarian and vegan specialties, and it’s estimated that 50% of Ghent’s population opts for vegetarian options. There is even a helpful map to find everything from casual buffets to award-winning seven-course vegetarian dinners. Hashtag Falafel, Greenway, and Lokaal are three favorites that are always near the top of the list for best vegetarian and vegan spots in Ghent. 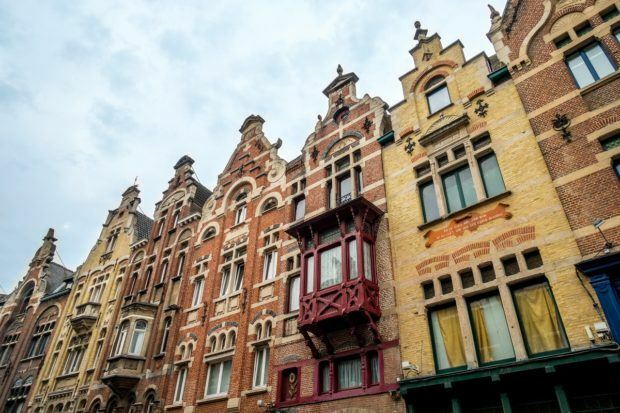 The twisting, turning streets of Ghent’s Patershol neighborhood are lined with 16th-century houses, artists’ workshops, and restaurants. For a moment, visiting here almost feels like you’ve stepped back in time. In a city known for its food, destinations in the Patershol are at the top of the list. From Turkish to Italian and Japanese to Spanish, there are lots of cuisines to choose from. Whether you want quirky, casual, or fancy, you’ll find something delicious and welcoming. Another highlight in the Patershol is Confiserie Temmerman, a classic candy shop with an ornate Baroque exterior. 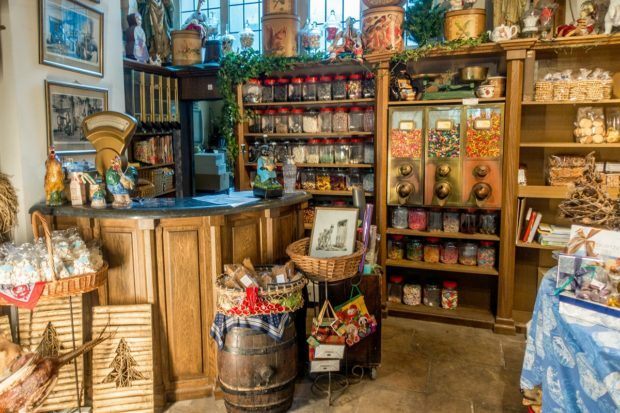 The oldest sweet shop in Ghent has been run by the same family for eight generations. Step inside to see their classic candies. If you didn’t stop for cuberdons before, Temmerman is a perfect place to buy a few. The end of June and early July brings the Ghent Jazz Festival. Belgian acts and big-name performers such as Sting, Gregory Porter, Herbie Hancock, and Norah Jones offer concerts for 10 days. In mid-September, visitors to the Festival of Flanders come to see nearly 200 classical and world music concerts of throughout the city. Together, these two events have earned Ghent the title of UNESCO Creative City of Music. Equally significant is the Ghent Festivities (Gentse Feesten), which happens for 10 days each July. It’s actually four festivals happening over the same period, featuring music, puppetry, street theater, and dance. The whole city turns into a giant artsy sea of musical and theatrical performances, including mimes, street performers, comedians, buskers, and free music of every genre across 10 city squares. 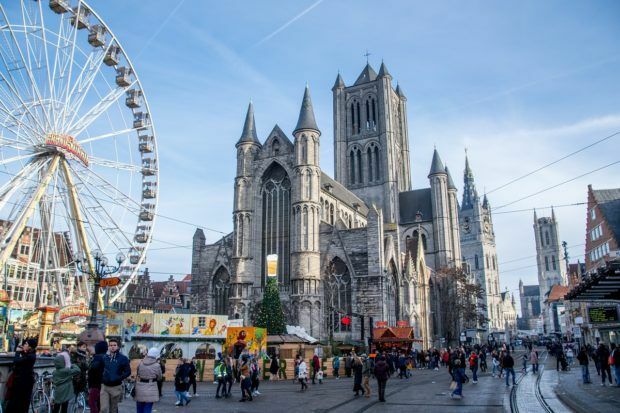 In December and early January, Ghent is all about the Christmas markets. 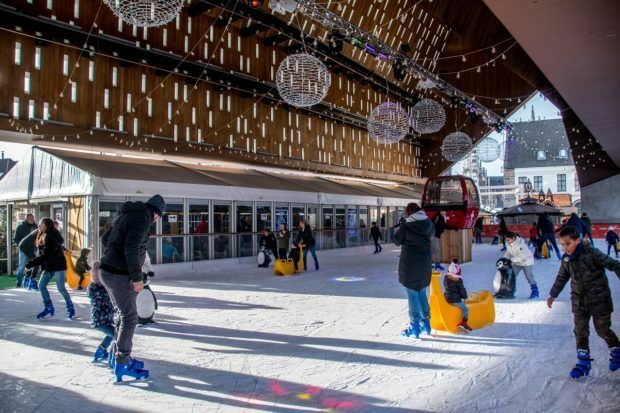 You can eat, drink, and be merry throughout the city with champagne, mulled wine, and melty, bubbling raclette around every corner. There is ice skating, lights, and plenty of opportunities for shopping at more than 150 wooden huts spread out from in front of St. Bavo’s to the Korenmarkt. 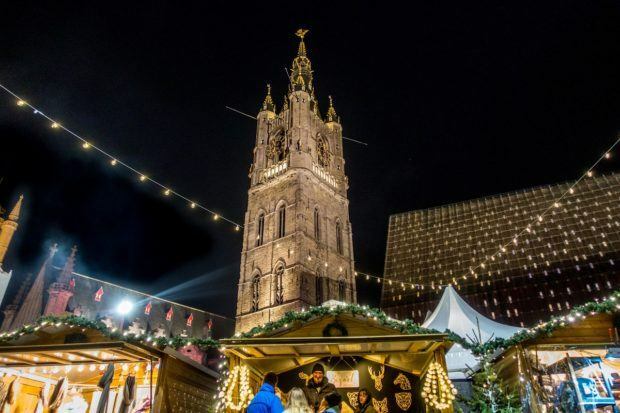 We visited six different Christmas markets in Belgium, and Ghent was among our favorites. 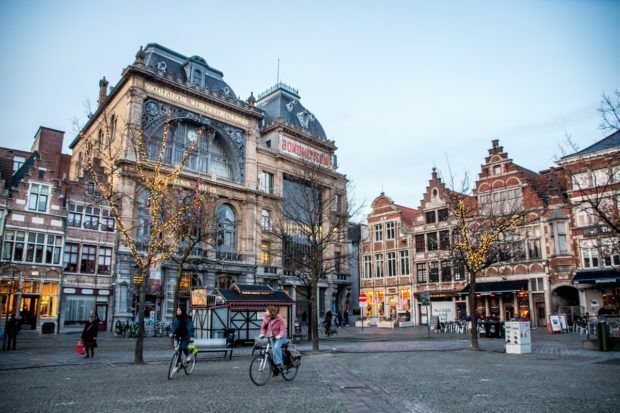 Other special events include culinary festivals like the Vegan Summer Fest and the Gent Smaakt, the Patershol neighborhood street party, and the annual Film Fest Gent. There is almost always something special happening here. High season is April through October, and the summer festivals in Ghent attract people from all over Belgium and the world, so prices increase. Summer weather is fabulous with lots of sun, but it rarely gets too hot to enjoy being outdoors. Late spring and fall generally have milder weather and lighter tourist crowds, except for holiday weekends. Late fall, winter, and early spring can be cold and wet. However, weather is unpredictable–we had abundant sun and no rain during our December visit compared with a cloudy, drizzly trip to Ghent in April. 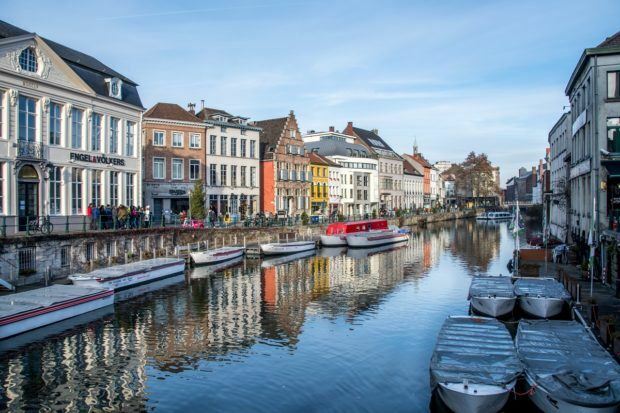 In northwest Belgium in the region of Flanders, Ghent is about 35 minutes by train from Brussels, which is well-connected worldwide via Brussels Airport. Ghent is roughly half-way between Brussels and Bruges. 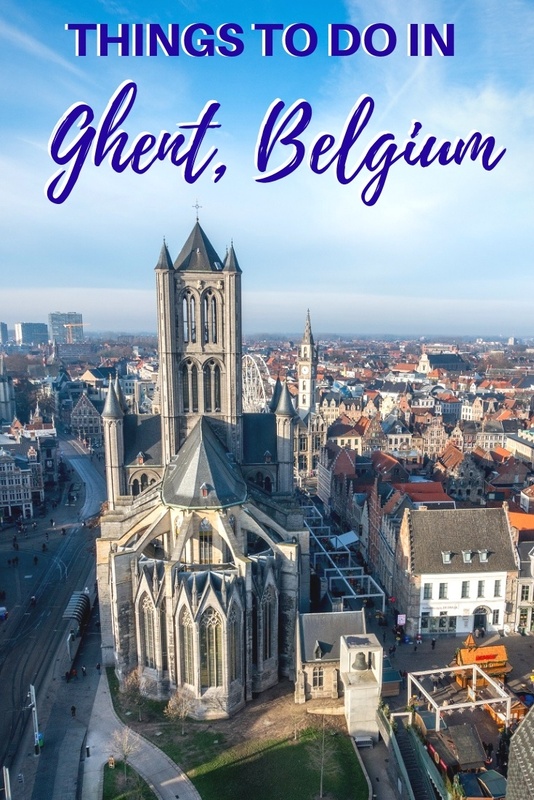 Some people choose to visit both Ghent and Bruges in one day, but we would suggest that itinerary only as a last resort because both cities (and Ghent, in particular) are worth a minimum of one day. 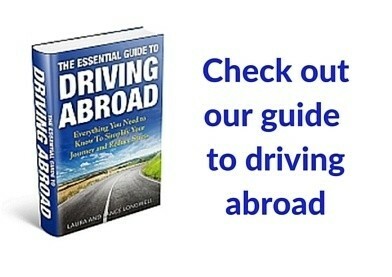 If you have to choose one or the other, these considerations might help you make a choice. Ghent is approximately one hour by train from Antwerp. What do you think about What to do on a Perfect Weekend in Ghent? Great post. I’ve been to Belgium several times, but never Ghent. I think I should go.